Ladies lose out narrowly | Everything Mayo! 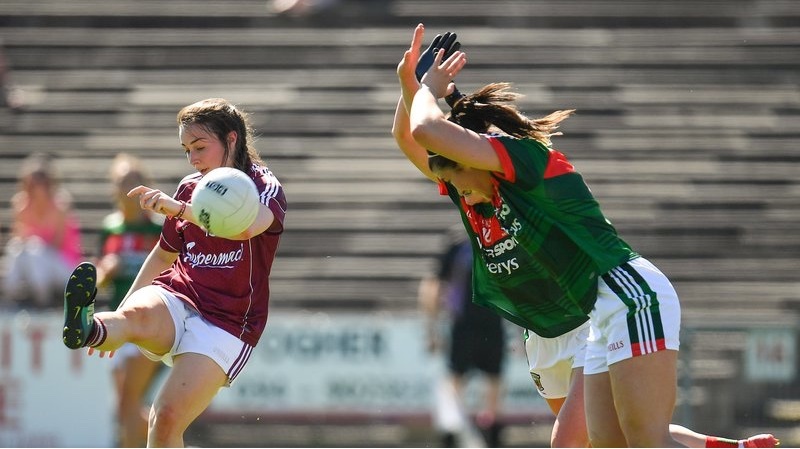 In swelteringly hot conditions at MacHale Park this afternoon, the Mayo ladies lost out narrowly to Galway in the Connacht LGFA senior football final. The contest was close from start to finish, with Galway claiming the game’s final two scores to win by two points, 0-17 to 1-12. Defending champions Galway led for most of the game but the home team never let them open up too big a gap. Galway got the first three scores and then stretched their lead to four points at one stage but the gap was back to two by half-time, at which point the champions led by 0-9 to 0-7. Galway pushed their lead back out to four points again after the break but then Fiona Doherty bagged the game’s only goal (video here) and soon after Sinead Cafferkey pointed to square the contest up with time running out. Coming down to the wire, however, it was the defending champions who held their nerve better. Two late points from them confirmed Galway as Connacht champions for the sixth time in the last seven years. All’s not lost for the Mayo ladies, though, as they now progress to the round-robin phase of the All-Ireland championship. They’ll be in Group 4 where they’re likely to come up once more against Dublin (assuming the Dubs win Leinster) and Cavan. Hard luck to the ladies on today’s result and the best of luck to them in the championship from here on. Match reports on today’s provincial decider – LGFA, Mayo Advertiser. The post Ladies lose out narrowly appeared first on Mayo GAA Blog.